In this Dec. 31, 2017, file photo, Las Vegas Metropolitan Police Department officers close Tropicana Avenue near the Las Vegas Strip. 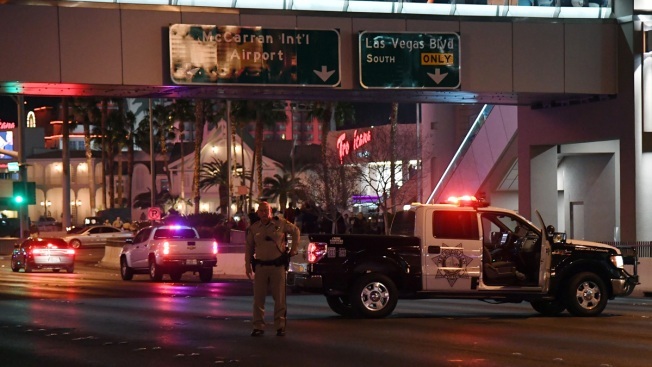 Police say a robbery suspect died Saturday following brief shootout outside the Bellagio hotel-casino on the Las Vegas Strip while an officer who was shot in his bulletproof vest escaped serious injury. Police Capt. Nichole Splinter said the suspect robbed the packed casino Friday night and was confronted by four officers as he tried to carjack a vehicle in the valet lot. Splinter said the suspect fired at least one shot at an officer before being shot by a second officer. "The officer had his bulletproof vest on, which probably saved his life," she said, adding that "it looks like the bullet hit the front of his chest and possibly went across." The suspect's death was confirmed by a police spokesman, Officer Aden OcampoGomez. No identities were released. Police did not disclose how much money the suspect took in the holdup.